Genetically compact, Florence has vivid white frangant flowers with a small creamy yellow throat. Flower in 12 weeks, 25-30cm tall. A dwarf freesia bred especially for pots. Plant bulbs 5 cm deep and 5-8 cm apart. 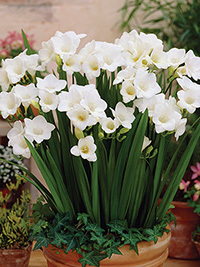 Freesia bulbs prefer to be planted where they will receive full sun but they will tolerate light shade. Do not over water.